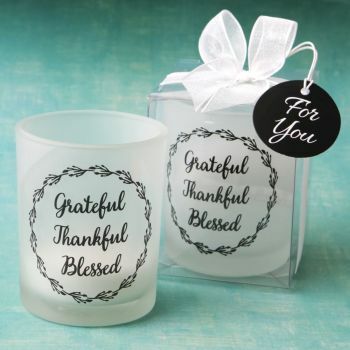 These stunning white frosted glass votive candle holders offer a glorious message that celebrates your Faith and brings good feelings to your special occasion. The votive is made of frosted white glass. It is decorated with a Grateful, Thankful and Blessed message. It comes with a white tea light candle. The votive is packaged in a clear acetate box. The box is wrapped with a white organza ribbon and bow. Attached to the bow is a black round 'For You' tag. Use these lovely votives to add a glowing ambience to your event venue and offer them as favors for your guests to take home as a memento.